We would like to welcome parents and teachers to become a part of our elite Super Duper Chaperone Club. We need dedicated volunteers to join our trips in order to make them a great success, keep everyone safe, and have a ton of fun. Check your registration flyer for specific information on how to become a chaperone for your student's trip and then check out the qualifications, duties, & expectations below. Must be 21 years of age & over and willing to supervise & encourage youth participants. 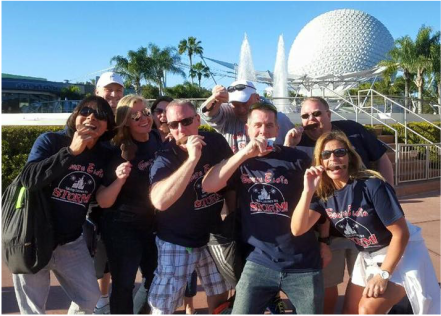 Have an infectious, positive attitude & promotes HAVING FUN on the trip! Lead by example and conduct themselves in a manner benefiting the school & community. Possess the spirit of helpfulness and flexibility. Abide by all school rules & policies and additional expectations which are in place for the trip. Understand that a clear head will be required at all times during the trip and alcohol or drug use is not permitted during the trip. Participate enthusiastically in all parts of the trip. Provide supervision, encouragement and guidance for all traveling students throughout the tour. Each chaperone will be assigned to a specific group of students for the duration of the trip. Do room checks & nose counts each evening at the hotel. Check out student rooms prior to departing from the hotel. Assist with sick students as necessary during the tour. Assist students in loading /unloading the bags under the coach in an effective manner. Stay flexible, calm and understanding when there are changes that affect the group’s schedule. Give POSITIVE support to the group especially after a performance. Acknowledge positive behavior and be FAIR with the students you supervise. Although the primary concern is helping all students, a chaperone's primary concern is to those directly under their supervision. Show your students TRUST by giving them some freedom when possible. Become GENUINELY interested in your students as you get to know them on a personal level. PROVIDE an outlet for individual students to talk over problems with you. Provide a good EXAMPLE at all times. Remember that students will mirror what they see from adults. Help dispel RUMORS through investigation. Do not repeat rumors that seem to be common on trips. Be CONSISTENT with the rules and regulations of the group. SUPPORT and ENCOURAGE the music faculty. They are dedicated individuals who have worked hard to make the trip possible for the students. ​Do things in pairs and be visible. Do not complain in front of the students or change established policies for the trip. Do not hesitate to volunteer your services when needed. Do not grant "special" favors to the students who are under your direct supervision. Students wish to be treated like adults. You don’t need to hand hold. Separate yourself from your own son or daughter unless he or she asks for your assistance. Do not use improper language or engage in any other negative behavior when students are present. Have a good time and ENJOY yourself, but remember that your first responsibility is always to the group.